This season of changes on “The Voice”, Executive Producer Mark Burnett added the element of a “Knockout” round that occurs after the “Battle” rounds. This time, no singers will be saved. 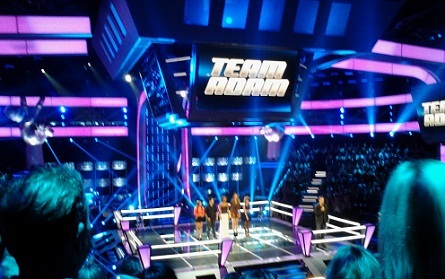 At the beginning of the Knockout round, the mentors each have ten contestants. These ten contestants come out into the boxing ring stage once more, one team at time. The mentor then pairs up who they’d like to see singing against each other. The contestants do not know until that moment on the stage who they’ll be singing against. During this Knockout round, the singers already have their songs prepared that they will perform. That’s right, the singers get to pick their songs! The singers then face-off one against each other – going up in front of the mentors in pairs. Unlike the Battle round where they must sing a duet – here, they sing their song one at a time. At the end of each performance, all of the mentors give their opinions on whom they think should be the keeper talent. Then, the mentor who’s team is on stage decides who to eliminate and explains their choice. At the end of the Knockout round each mentor will have a team of five remaining under their guidance. Here’s a sneak-peek at some of the singers that Adam chose to pit against each other: Joe vs. Brian; Amanda vs. Michelle; Lauren vs. Nicole; Melanie vs. Sam. A very big surprise comes from Lauren who takes Adam’s advice and takes-on another personality during her performance on stage. The two power house singers on Adam’s team are: Amanda and Michelle. They made it tough for Adam to choose.